Fox has announced special exclusive limited edition vinyl soundtracks for Deadpool, Logan, The Kingsman, and the first two Planet of the Apes movies. San Diego Comic-Con is just around the corner and the list of exclusive merchandise has started to grow. Funko has exclusive POP! figures, Hasbro has announced Revolution comic crossover figures, the Hilderbrandt Darth Vader figure, Voltron figures, and way too many more to list here, but you get the idea. Aside from action figures, vinyl records have started to pop up as Comic-Con exclusives over the past few years and this year is set to be a special one for fans of the evergreen formatl. The Hollywood Reporter has revealed that Fox will release the soundtracks for Deadpool, Logan, The Kingsman, Rise of the Planet of the Apes, and Dawn of the Planet of the Apes. But these aren't just ordinary pressings of the soundtracks. In edition to coming with Blu-ray discs, DVDs, and digital versions of the movies, they come with expanded art that is sure to get collectors reaching for their wallets. 3 out of the 5 are pressed on double LPs and Logan even comes with the noir version of the movie. Not much information has been given about the weight of the records, but it's safe to assume that they're pressed on 180-gram vinyl. 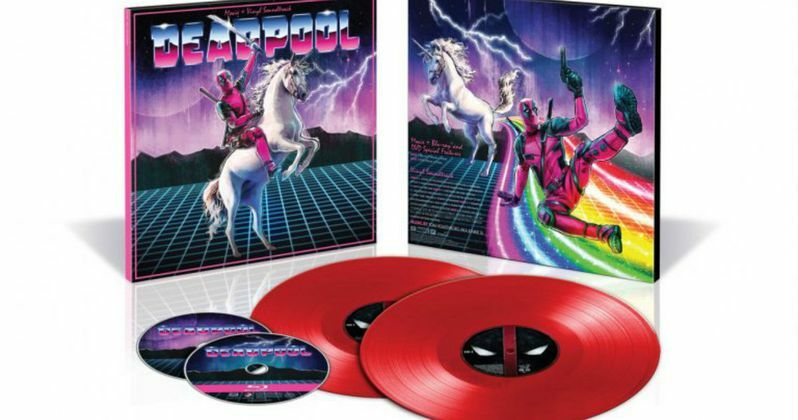 Deadpool is pressed on 2 red colored vinyl with a cover depicting the hero riding a unicorn in some weird looking Tron world while the Logan soundtrack is pressed on black vinyl with an alternate cover that looks cool, but definitely not as cool as the rest. Rise of the Planet of the Apes is pressed on black vinyl and the cover looks amazing with an artist rendering of Caesar on the cover, much like the Dawn of the Planet of the Apes, but with the soundtrack spread across two records. The Kingsman is sleek and simple, also pressed on black vinyl with a British flag printed on the label of the record. In vinyl related news, Mondo is releasing a limited edition color record for the soundtrack to the legendary video game Contra. The artwork is stellar, spread over a deluxe gatefold sleeve and the vinyl is a cool looking orange, red, and yellow that is limited to 1,000 copies. Mondo is also responsible for the amazing 7" vinyl set for the Inside Out soundtrack that made cover art based off of famous records. The sets were limited to 500 and sold out incredibly fast, though a limited run was announced via their website later. It is not clear at this time how many of each soundtrack that Fox has pressed up or any price information yet, but it's safe to say that these will sell out. The artwork alone will sell the records. San Diego Comic-Con runs July 20th through July 23rd and the vinyl soundtracks will be available at the Fox Fanfare Booth (#4229). In the meantime, check out the artwork and track listings below.